The Cooperative Africana Materials Project (CAMP) recently completed microfilming sixteen newspaper titles from Cameroon. Most of the issues microfilmed date from the mid-1990s, although CAMP has preserved additional date ranges for many of these titles. This project began through a donation of newspapers by Ms. Carly Goodman, a graduate student at Temple University. Dan Reboussin, African Studies Curator at the George A. Smathers Libraries at the University of Florida, provided complementary issues to extend the collection's scope. 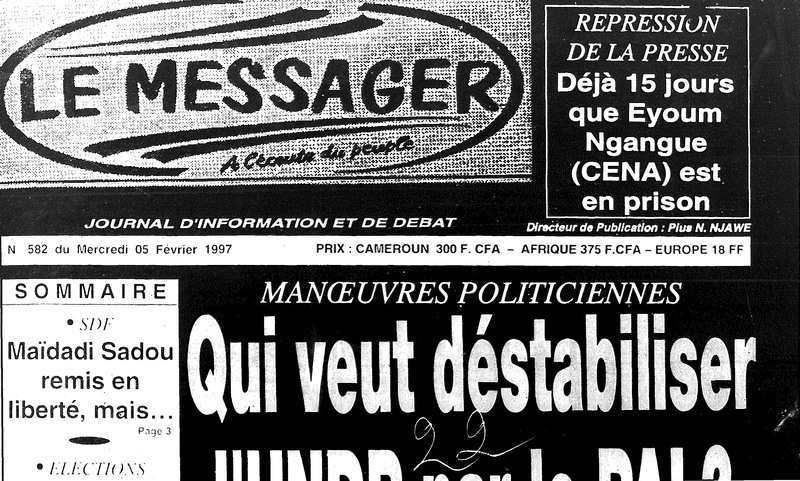 As elsewhere in Africa during the 1990s, Cameroon saw the legalization of multiple political parties and began to allow privately held and relatively independent uncensored newspapers. When, inevitably, political disputes arose, this political and civil society liberalization gave voice to many groups and individuals previously suppressed. Cameroon’s newspapers of the time blossomed with articles, editorial opinions, cartoons, and a critical and creative force that hadn’t been seen in independent Cameroon.